The late Yogi Berra, renowned New York Yankees catcher, is sometimes remembered less for his exceptional play and more for his turns of phrase. 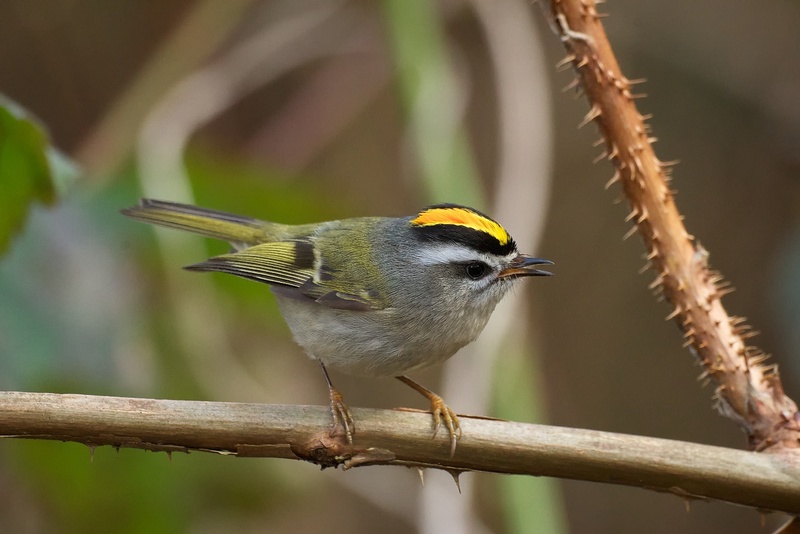 One of which was reported as, “You can observe a lot by just watching.” When it comes to observing birds such as this Golden-crowned Kinglet, Berra was right on the money. To give yourself the best chance to watch nature unfold, pick a spot outdoors and sit quietly for 15 minutes. Now you’re part of the background. The birds will likely return to singing, to perching in the open, to flying just above your head. Which, when it comes to observing birds, is right on the money. Let’s try it out. To give yourself the best chance to watch nature unfold, to really be immersed, pick a spot outdoors and sit quietly, patiently, for 15 or 20 minutes. Sit still. Listen. This may allow the birds and other creatures to return to what they were doing before you arrived. Now you’re just part of the background. [Forest bird song ambient] The birds will likely return to singing, to perching in the open, to flying just above your head. Bird sounds provided by The Macaulay Library of Natural Sounds at the Cornell Lab of Ornithology, Ithaca, New York. Sounds of baseball game recorded by John Kessler.